On the plus side, that gives me a chance to post one more (but maybe more will be coming…who knows) soup recipe since winter is not over yet here in Wisconsin! I’ve come to really enjoy soups this winter and I love the ease of them. It’s like the winter form of a salad (kind of)—throw lots of random cut up vegetables, beans, and whatever else into a pot, let it simmer, and magically you have a wonderful and comforting creation! 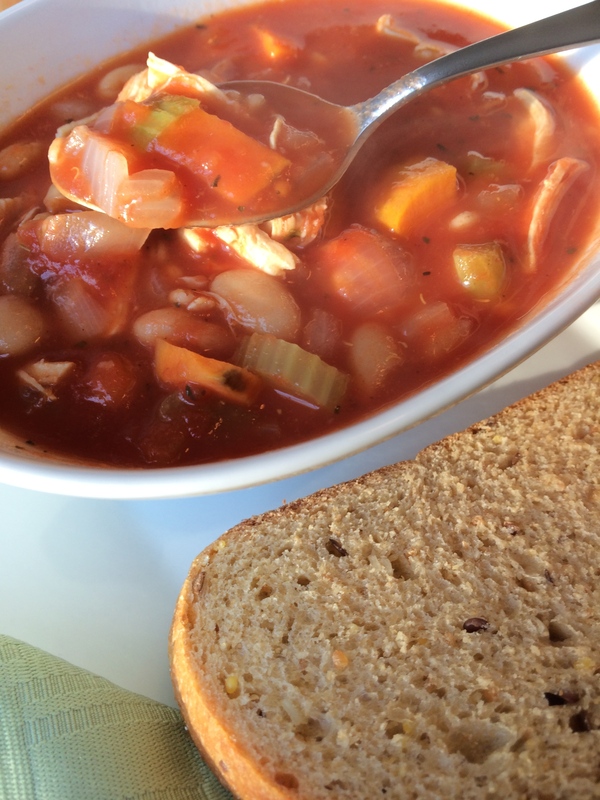 My Chicken Minestrone Soup is no different, which is why I love it. It really is ready in about a half hour and is perfect for a quick, comforting week night meal. 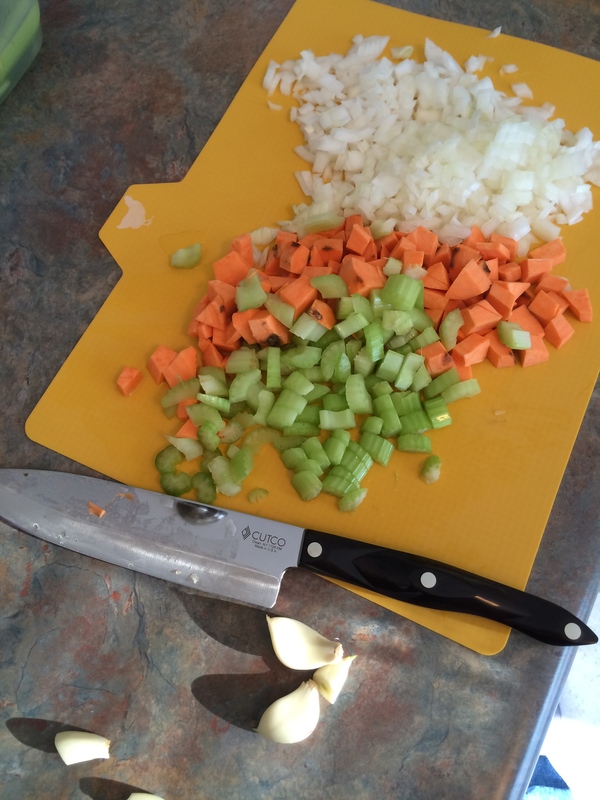 The base of the soup starts off with chopped onion, celery, sweet potato, and garlic. I love the simplicity of these ingredients, yet they are packed with nutrients that are easy to slip into the soup. I absolutely love sweet potatoes and am always looking for ways to incorporate them into my meals—which is funny since I used to detest them up until a few years ago. This just goes to show that constant exposure to foods can eventually lead to you liking the food. It can take about 18–20 exposures using any of your senses—not just tasting it—for you to grow to like a food. That’s why it’s important to keep offering your kiddos those peas or whatever else they so desperately despise right now. So for all you vegetable-haters, don’t give up on those Brussels sprouts yet! Philip is one who can’t seem to like sweet potatoes…but I keep trying! (We’ve got to be getting close to 18 exposures…) For now, as long as the sweet potato is hidden in a soup, it seems to be at least tolerable for him; I’ll take it as progress. Not to belabor sweet potatoes for too much longer, but they are a great source of vitamin A and C, potassium, and calcium believe it or not. Going back to my “color philosophy,” the more color in vegetables the better. I rank sweet potatoes a little more nutritious than regular potatoes. Although there’s nothing wrong with a good ol’ russet potato in itself, sweet potatoes and their rich, orange color just offer a few more nutrients than it’s cousin. Once the base veggies have been given time to sauté and soften up a bit, the crushed tomatoes, beans, broth, cooked and shredded chicken, barley, and seasonings are added in and simmer together for about 15 minutes. I don’t really care for chunks of chicken in my soups, so I always poach a chicken breast and then shred it up before adding it into the soup. Poaching simply means boiling some water, adding in the chicken and letting it cook for about 10 minutes, depending on the size and thickness of the chicken (or until it’s not longer pink in the middle), taking it out to cool, and shredding it by hand. 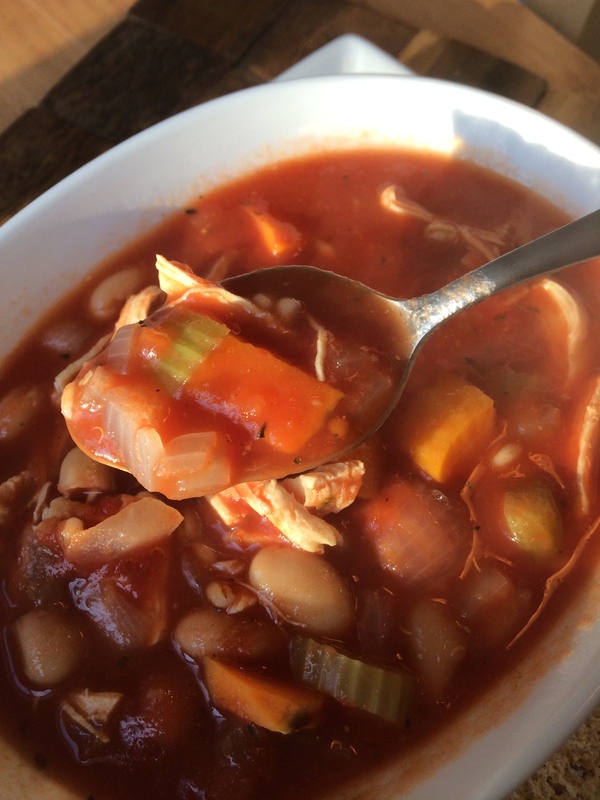 To cut back on the sodium, I rinse my canned beans and I use no-salt added crushed tomatoes and no-salt added chicken stock. I’ve used no-salt added chicken stock before on the blog with my Homemade Chicken Noodle Soup, and I don’t feel that the lack of salt diminishes the flavor at all. This soup was definitely not lacking flavor! And then it expands slightly when it cooks. It’s a whole grain, meaning it contains the entire seed of the grain, and it doesn’t leave out any of the good nutrients we need. 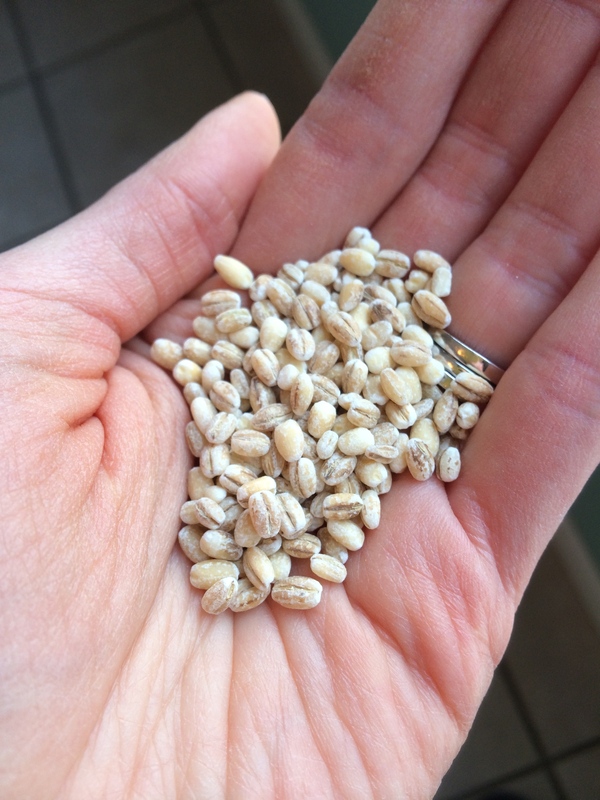 Barley, like all whole grains, is full of fiber. This helps lower cholesterol, improves blood sugar control and insulin sensitivity, improves digestive health, helps with weight management, and keeps you fuller longer (no need for an after dinner snack with this soup!). Whew, who wouldn’t want to try barley after all that? It’s best to use quick-cooking barley if you want a quick meal (it still has all the good health benefits I mentioned, but most of the cooking has already been done prior to packaging; you just need to rehydrate the grain, making the cooking process a lot shorter), but I, unfortunately, didn’t have that on hand. Instead, I just let my soup simmer for about 30–40 minutes instead of 15 minutes. Now wasn’t that easy? Soup is done! 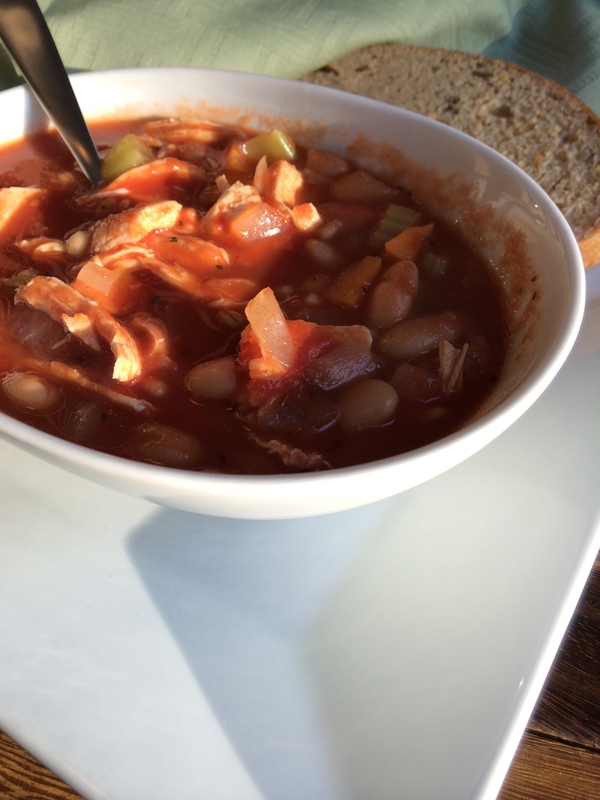 I normally don’t like tomato-based soups, but this one wasn’t too “tomato-y” and had so many other great flavors going on with the sweet potato and the beans and lots of different textures with the barley and veggies that it was perfect. I’m a bread dipper when having soup, so I added soft, bakery-style whole wheat bread on the side to fulfill this role. It definitely completed the meal…and significantly contributed to helping me meet my whole wheat quota for the day! With soups like this one, I almost wish winter could last a little longer…almost. In a large saucepan, heat oil over medium heat. Add onion, celery and garlic. Cook until onion is tender, about 3 minutes. Add sweet potato and continue to cook for 2 minutes. 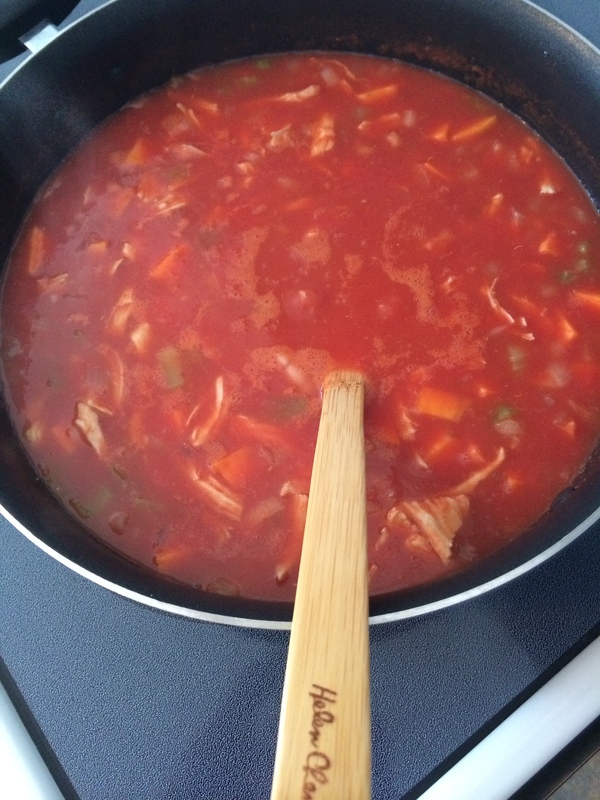 Add tomatoes, beans, stock, cooked chicken, barley, oregano and basil; cover and simmer for 15 minutes (If not using quick-cooking barley, let soup simmer for about 30–40 minutes, or until barley is tender). oh I love soups in this season.. :) I have to try this one too…..! I feel like soup season has been extended this year…and I’m really ok with it! They’re always so easy to make and leftovers can taste even better the next day. 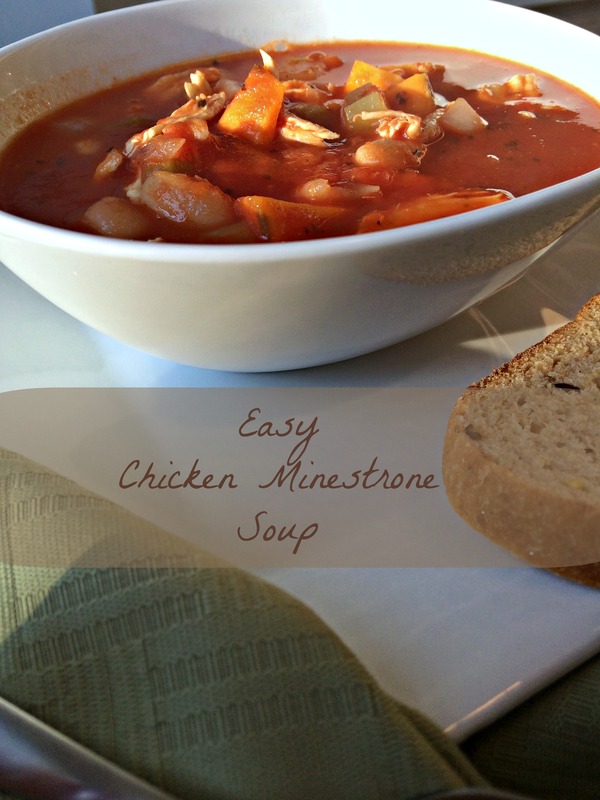 This minestrone is no different! I love ministrone, but my common complaint is that it doesn’t have enough protein. This looks great, because the added chicken fixes that! Plenty of protein in this one! The chicken, barley, *and* beans really packs it in there!